Send warm wishes this Christmas with a truly unique bouquet of luxurious red tulips. Their bright red petals stand out even more thanks to the lush Christmas spruce and we have added cinnamon and pinecone picks for added texture and contrast. A sensational seasonal bouquet perfect for making somebody special smile this Christmas. 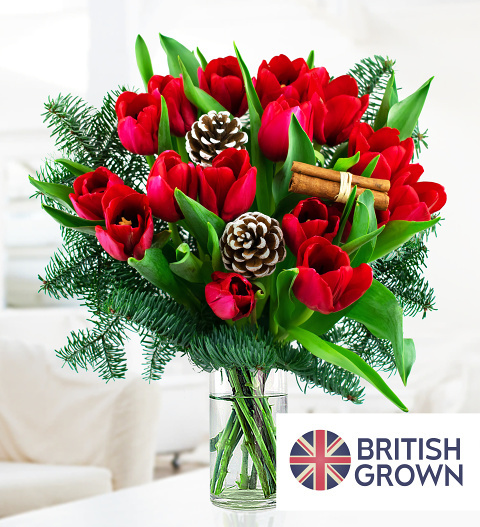 This stunning bouquet includes Red Tulips, Pine Cones, Cinnamon Stick and festive Norwegian Spruce. Chocolates may contain nuts.